Pier 4 Plaza in Boston’s Seaport District, has just reached completion. The site is linked to Boston’s existing Harbor Walk, creating a link and public access area to the city’s existing walkable waterfront edge. The site was developed in part with the new construction of a high rise residential building, 100 Pier 4 Luxury Apartments. 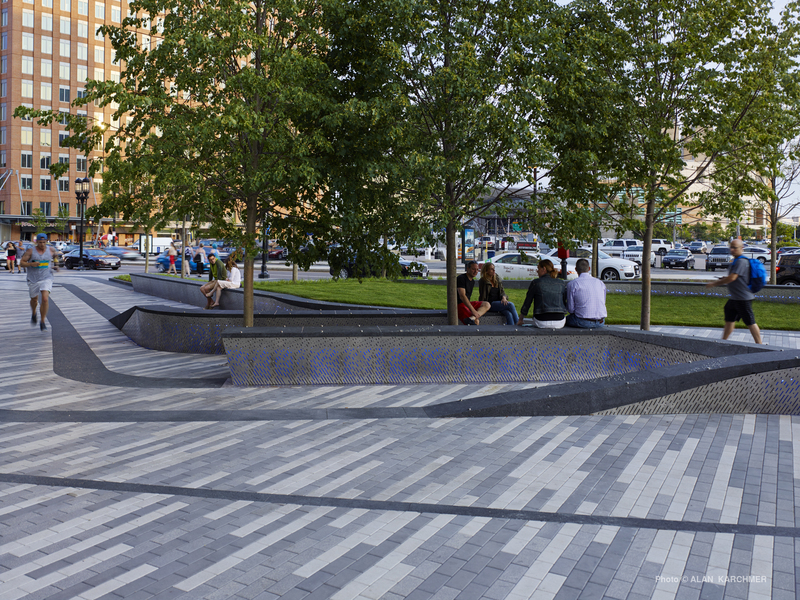 Sitting at the current intersection of Seaport Boulevard, North Avenue and Pier 4 Boulevard, the public plaza is framed by a series of perimeter trees and plant beds that integrate a series of sculptural granite / stainless steel seating elements. We worked closely with fabricators to develop a continuous granite paving pattern within the plaza that would transition up from the ground plane, to a sit-able seating surface for pedestrians. Construction of the buildings Ground Floor and Second Floor is still in progress as 100 Pier 4 is preparing for its new tenants. A Request for Interest was released this past spring to seek programming ideas for a cultural space at Pier 4 and after review of multiple proposals, UDR and the BRA have chosen a group. See link [here].